As part of the new gym focus, we continue to look for and focus on unique gym’s across the world and this selection is no different. The gym we’re featuring here has been brought to you by a brand more associated with office workers and is geared towards that particular audience. 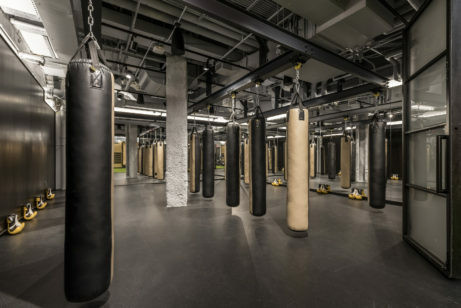 Although there are several gyms in New York’s Financial District (FiDi), Rise by We is a unique concept in that it has been opened rather quietly by WeWork, which is better known for their co-working offices, where they rent desks, office and shared working spaces around the world. 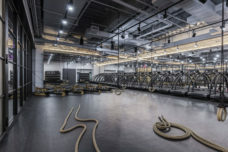 The Rise by We gym is the first venture into the wellness arena by WeWork, and we’re impressed. It looks stunning. 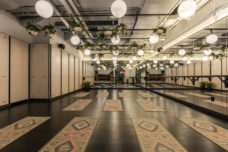 In a nod to casual workers, you do not have to be WeWork member in order to access the Rise by We gym, although it’s effectively part of the office space on WeWork’s 85 Broad Street. It has been designed by the WeWork’s head of interiors, and if you’ve ever been to a WeWork you will know they place a lot of emphasis on the experience, making you feel relaxed whilst you work and do business. Rise By We is no different. The gym has equipment divided into three different sections for a variety of classes and drop-in sessions. Fight is for any martial arts or boxer where you’ll find the studio full of punchbags hanging from the ceilings, with mirrored walls. Flight is designed for cardio such as running, rowing, cycling and other functional training. Insight is designed for calmer activities such as meditation and yoga, which plays a key to your over mental health, but is also great for physical well being, more on this later. There’s a separate Turf area which is an area where you’ll find a huge astroturf area where you can flip tyres, push a prowler, do some ladder work, get the ropes out and much more. If you prefer to get fit in a group environment, there’s a full schedule of classes running from 7am through 7pm. You could join a Fight class, enter in a circuits class at the Turf Performance session or if you prefer some relaxation time, join the Flow class which combines methods from vinyasa, jivamukti and restorative yoga. There’s also a Superspa where you can expect to find a mineral pool, steam room, sauna room and a number of treatments. An in-house cafe offers a lightweight breakfast, lunch and post-work dinner, snacks, smoothies and even teas (but we note, no coffee!). Pricing is more competitive than we expected. A Studio membership offers unlimited classes for $180/month, full Superspa access and 5 guest passes so you can take a friend for free. With no annual contract, you can cancel at any time, too. There’s also a separate semi-private customised training programme available for $360/month, whilst a no-commitment drop-in price of $35/session is available. We were slightly disappointed to see no discounts for WeWork members. Rise by We is a special concept from a company which has disrupted the office industry and now seems determined to do the same in the wellness. This is definitely a gym we want to visit next time we’re in New York. If you own a private gym or public gym with a difference, let us know and we’ll get you featured on Short Motivation. Alex is a keen fitness and nutrition enthusiast, residing in the US, and contributes to travel, fitness and nutrition tips, news and other interesting tidbits.